Not that the Bulls should have won Tuesday’s game against the Toronto Raptors with their three best front court defenders, Joakim Noah, Taj Gibson and Luol Deng, all out injured and the Raptors leading by double digits every quarter and by 16 points with 8:22 left in the game. But when Nate Robinson fired up a desperation three pointer from 40 feet at the buzzer that could have tied the game after Robinson let a pass slip through his hands for a good look for a three just seconds before, Robinson dropped his head into his hands in something of a statement about this dying Bulls season. With the obvious that the regular season ends in a week, and forget Derrick Rose, though as he’s said he hasn’t ruled anything out. Richard Hamilton did return from his back problems and had four points off the bench in 14 minutes. But you don’t go into the playoffs with half a team not having played the last weeks of the season. Injuries, as it’s always said, are part of the game. But you also don’t walk right back into the NBA after not playing for awhile and have playoff success. As it was clear with Hamilton and Marco Belinelli, the latter back as a starter with a quiet eight points. With the back to back losses, the Bulls pretty much have ended any chance of having a home court advantage in the first round of the playoffs with the Nets winning again and taking a three-game lead for fourth. But the loss also left the Bulls just a half game ahead of sixth place Atlanta, though the Bulls have the head to head tiebreaker. I know there’s much talk about avoiding the four/five playoff spot, which would mean a second round series with Miami, which beat Milwaukee Tuesday in a first round preview. But if the Bulls were to fall to sixth it would mean a first round series with Indiana, which is the only team of the top five in the East against whom the Bulls don’t have a winning record. The Bulls have had perhaps the most success and best games against Brooklyn of all those teams. Forget Miami and the conference finals. You have to get out of the first round first. And it would seem to be the most difficult against the rugged Pacers, especially with the Pacers regulars playing for weeks and the Bulls trying to nurse players back into the starting lineup. You just don’t sit out two or three weeks and then play at full speed to open the playoffs. You could be in for a very short playoff run once again. It certainly looked that way with another slow start against a team basically playing out the season and most of the time unmotivated as the Raptors were leading the league in most games since scoring 100 points, had lost eight of their last 11 and hadn’t beaten a team with a winning record in the last six weeks. But led by DeMar DeRozan with 20 points and Rudy Gay with 19, the Raptors dominated much of the game until a late surge led by Robinson’s 14 fourth quarter points and a career high 28 points from Jimmy Butler. It’s difficult to see how with the Bulls giving life to teams planning vacations and perhaps saving jobs for coaches with shaky situations. The Bulls of late with their ever changing rotations and jumbled defense with their top players out are becoming something of a welcoming Statue of Liberty to those with the least hope around the NBA. The Bulls are helping awaken the most tired of teams, the wretched refuse in places like Toronto and Detroit see signs of promise that they can come home with their heads high once again because of the masses of Bulls players not even getting close enough to breathe on them on defense. Yes, the Bulls showed resilience, as they will do, in not giving up on a game and amazingly having a chance to tie at the end. With 1:38 left, the Bulls trailed 99-90 and it certainly seemed over. But Robinson made a nice find for a Carlos Boozer layup (yes, that Robinson). And after the Bulls forced Toronto into wasting the 24 seconds, Robinson ended up with his own miss and made a three to bring the Bulls within 99-95 with 54.6 seconds left. Maybe they shouldn’t have left so early. The Raptors with primarily a jump shooting team are known to regularly blow big leads. So after Gay missed on a bank shot, the Bulls fought off a pair of misses to get Boozer back to the line making two free throws with 16.8 seconds left to bring the Bulls within 99-97 with 16.8 seconds left. Would they pull this one out? The Bulls intentionally fouled DeRozan, who made both for a 101-97 lead. The Bulls went to their go to guy, Robinson—yes, true—and he was fouled. Robinson made the first. But seeing the second hit the front rim, Robinson hustled after it and appeared to save it. The whistle blew, apparently inadvertently, and the officials called a jump ball. Boozer lost the tip. But he dove on the floor to get a shot at the ball and tipped it back to Robinson who was open from about 28 feet… for the tie! No! The ball slipped through his hands in something of a metaphor for the rest of the season for the team. By the time Robinson retrieved it he was in the backcourt with a second left and heaved a shot that missed. They wouldn’t have deserved it, anyway. Yes, Butler was terrific and it seems the Bulls have stumbled into a shooting guard for next season. Butler played all 48 minutes starting at small forward for Deng. And though Butler is still hesitant about the three from the arc, he made three three pointers from the shorter baseline corner in a highly efficient 10 of 12 he gets basically through hustle as the team doesn’t run plays for him. “Knowing that they want me to be here alongside Derrick and all these other guys makes me smile,” said Butler, who added it didn’t matter much without the win. The Bulls also had a bit of a smile for a nice, hustling game from Malcolm Thomas, the hero of the 2012 summer league who played overseas this winter. The Bulls just signed him for the season and he had six points and eight rebounds in a nice reserve stint for Nazr Mohammed, who was having trouble with the more athletic Raptors. The Bulls, though, have more figuring out to do, which basically depends on whether anyone else can play. Deng could play Thursday against the Knicks, though it remains uncertain when Gibson and Noah, the latter with his recurrence of plantar fasciitis, will return. The Knicks come into Chicago for the national TNT game the league’s hottest team winning 13 straight and likely not wanting to be swept by the Bulls this season. It figures to be another tough one with another national TV game Sunday in Miami against the Heat, who didn’t like what they felt was rough and unsportsmanlike treatment by Bulls players in breaking their 27-game winning streak last month. “It’s more our collective effort from the start,” said Thibodeau. 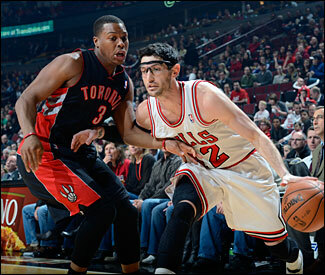 It was pretty poor as the Raptors bolted out 18-3 with just a field goal for the Bulls to three touchdowns. Though Boozer almost had a triple double with 19 points, 11 rebounds and eight assists, he started poorly as the Bulls with limited offensive options tried to go inside and Toronto was ready with a hard double. It is the state of the Bulls now that opposing scouting reports say to take Boozer out and you will beat the Bulls. Boozer missed five of his first six shots. But the extra attention to him enabled Butler to clean up with some opens lanes to the rim. Thibodeau even went to Thomas in the first quarter and the Bulls at least got within 31-22 after one. But it was a brutal defensive effort against a shaky offensive team with Toronto shooting almost 60 percent well into the second quarter. After Toronto got ahead 41-27 early in the second quarter, the Bulls first rode Butler, whose driving skills are strong. 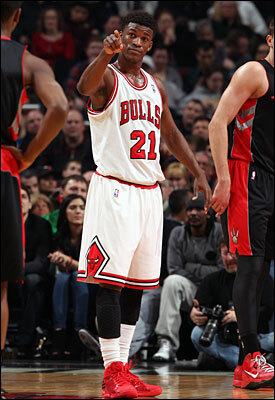 He would have the highlight dunk of the game early in the third on a lob pass from Kirk Hinrich. Butler got the Bulls back into it penetrating and dropping off nice passes to Boozer and going hard to the basket on his own. Then Robinson gave the Bulls a closing kick that got them within 54-50 at halftime with a three on a clever Boozer find and a running banker to end the half. But you could see why Boozer was having some issues with Robinson on the floor. It’s not always if you pass but how you pass. Boozer was setting up in the post in the paint. But Robinson isn’t good at that post entry pass. So Boozer had to take a few steps out to get Robinson’s passes. Now his shot was much tougher and longer and he missed. The Bulls then brought Hinrich around to Boozer’s side, and Hinrich not only got Boozer a good pass inside, but when Toronto doubled and the ball went out, Hinrich remained patient and got the ball back to Boozer deeper before the double could get back. Boozer got a couple of easy scores and the Bulls were back in the game. The Bulls weak side help with Mohammed and now Thomas who is new to the system was often non existent. Often a strength, it’s a good reason why the Pistons and Raptors, both bottom half shooting teams, shot better than 50 percent. The Bulls defense in general terms forces drivers out of the paint, or the middle toward the baseline. So the interior defenders are supposed to come up. Thus the guards shade toward the middle. Even Robinson was doing this well. But there was little help, which got the inexperienced Thomas 26 minutes as he could at least react more quickly, if not always efficiently. But after that big Butler lob dunk finish early in the third, the Raptors ran off 12 straight points as Butler was a bit hesitant to fire one up out front, Boozer made a lazy outlet pass for a turnover, Belinelli was well off and the athletic Toronto guards were again driving the ball and not settling for their favorite bad jumpers. Toronto ended that 12-0 run with a Gay three to lead 76-60. 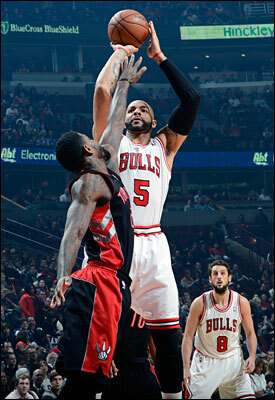 But Boozer, a good passer, found Thomas for a couple of scores as Toronto kept its defense tight on Boozer. The Raptors still led 81-68 after three and pushed it to 91-75 with 8:04 before the Raptors got a little full of themselves. Not that they were laughing all the time, but the Raptors were having fun for a change, which is happening against the Bulls lately. Earlier in the game, Boozer ran into a courtside cameraman and the camera popped onto the court, where the Raptors Amir Johnson picked it up and began taking pictures of his teammates. Meanwhile, someone named Quincy Acy got a technical foul for taunting, and that got the Bulls on their own 10-0 run with a Robinson steal leading to a Butler clear path foul and Robinson, who had 22 points on seven of 22 shooting, setting his career record for threes in a season to bring the Bulls within 91-85 with 5:34 left. But there wasn’t enough to finish the comeback as Jonas Valanciunas, who after the game has to be carried out when suffering a whiplash injury diving on that final play, faked Mohammed and drove uncontested for a score. And after a Robinson turnover after which he was yelling at Thomas, Kyle Lowry got Mohammed on a switch, no one came to help and Lowry scored easily to put Toronto back up 10 with 4:33 left and they had just enough distance to hang on. Which was the operative word for the Bulls: Help!